Kitchen counters are always a focal point in remodeling a kitchen. 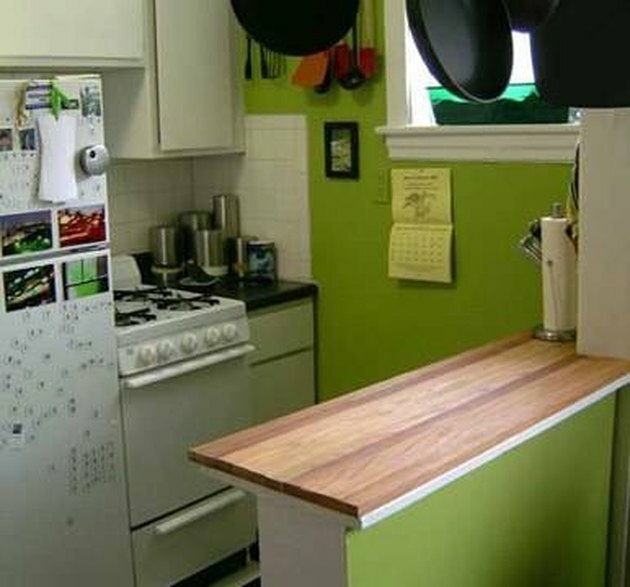 In the past, materials used as a product for building kitchen countertop decks have varied. The best material to use is ¾-inch plywood. One reason plywood is the best choice to build countertops is due to its durability after getting wet. Set the table saw fence at 26-inches. Place the ¾-inch plywood on the table and rip it at this width. This will result in producing a piece of plywood that is 26-inch wide and 96--inch long. Set the table saw fence at 2-inches. Rip three pieces of the plywood left over from the previous cut at this measurement. Apply glue to one of the 2-inch sides of the 2-inch material, place it on the edge of the piece of plywood from Step 1 and secure it with the box nails. Repeat this process for the other long edge of the plywood. Measure and make a mark at 22-inches on the remaining 2-inch strip of plywood. Place the miter gauge in the groove on the table saw, be certain it is set on 90°, line your mark up with the blade and cut the piece. Repeat this process so you will have two pieces of 2-by-22-inch plywood. Apply glue to a flat side of the 22-inch plywood, place it on one end of the plywood countertop and secure it with the box nails. Repeat this with the other 22-inch piece. Turn the top over and cover it with the desired material. Clean up excess glue immediately with a damp cloth.